SWOT Analysis: Should small business conduct this analysis? - Brilliant Breakthroughs, Inc.
Home › Business Strategies › SWOT Analysis: Should small business conduct this analysis? SWOT Analysis: Should small business conduct this analysis? Is it appropriate for small businesses? Do you know the benefits of performing a SWOT Analysis? Have you ever conducted a SWOT Analysis? Who is the best person to conduct this assessment? SWOT Analysis are a practical assessment tool to understand an organization’s Strengths (S), Weaknesses (W), Opportunities (O), and Threats (T). Of all the analysis tools, I still continue to find the SWOT Analysis to be one of the most powerful and practical for any size organization. Why? Regardless of your business’s size or type, anyone can perform a SWOT Analysis. Additionally, it provides useful information to immediately act upon to improve your overall business’s performance. SWOT Analysis definition, according to the Business Dictionary: Situation analysis in which internal strengths and weaknesses of an organization, and external opportunities and threats faced by it are closely examined to chart a strategy. SWOT stands for strengths, weaknesses, opportunities, and threats. Often you will hear SWOT Analysis abbreviated as SWOT. Eventhough this is a situational analysis, I encourage those who are unfamiliar to begin with this very basic assessment. It will guide you to further understand your business’s strengths (S) and weaknesses (W), which are internal and controllable from the business’s standpoint. Another way to consider the S and W portion of this analysis is: this is what you are able to adjust because you choose to do so. Hopefully to improved results. The Opportunities (O) and Threats (T) are the external and uncontrollable situations which impact your business’s performance. Anther way to consider the O and T portion of this analysis is, these are external circumstances or situations, which will impact your business whether you like it or not. All for the benefit to know your approach to maximize on each potential O and minimize each potential T.
Are you now considering conducting a SWOT Analysis for your business? Have you ever thought of doing a SWOT Analysis on yourself, as a business owner/leader of your business? Good news: Currently I am in the middle of developing a 3 week “How to conduct a SWOT Analysis for My Business” Workshop for Small Business Owners. Whether you are a solo-entrepreneur or have 30 staff members, you will benefit. I will be conducting this in March 2015. On Feb. 18, 2015 post, I will share more information. Until then, we will continue to share some ideas of what you should be reviewing for each of the SWOT Analysis areas. 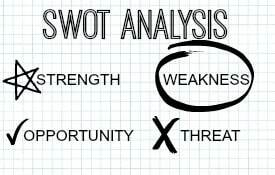 Please feel free to comment what value a SWOT Analysis may offer your business’s performance. please call Maggie (262) 716.7750 for YOUR No-cost Consultation. p.s. If you are local to Southeast Wisconsin, check out Wisconsin Business Owners on Meetup. This group has been meeting for over 10 years and helps business owners develop enhanced personal and business relationships in a learning environment.